Toyota took the endurance racing world by storm in 1998 when the GT-One entered the Le Mans 24 Hours. The GT-One was an instant success, recording both the fastest lap and the highest top speed of any car at the event. This chap managed to dodge the lens stickers — here's the inside of the museum at the cologne HQ! Getting to Cologne from the North West of England is not as easy as it once was. In the early 2000s one could fly directly from Manchester on a half-cargo, half-passenger service operated by Hapag-Lloyd. Nowadays it’s a flight into Düsseldorf before the 40-minute drive south. Perhaps it’s because there are less Brits heading to Cologne these days? Certainly one of the big draws has disappeared: the Toyota Formula 1 team. Toyota F1 was based in a cavernous 30,000 sq. m series of buildings situated on one side of ‘Toyota Allee’, now the home of the company’s FIA World Endurance Championship team. The site has been HQ to Toyota’s motor sport, tuning and accessories divisions since 1979 growing to incorporate new race series’ along the way. The site previously housed the wildly successful World Rally Championship (WRC) team — makers of some of the most poster-friendly rally cars of the last 20 years. The group added to the WRC team with the endurance racers in 1998 when the GT-One entered the Le Mans 24 Hours. The GT-One was an instant success, recording both the fastest lap and the highest top speed of any car at the event. The same was true in the 1999 outing. 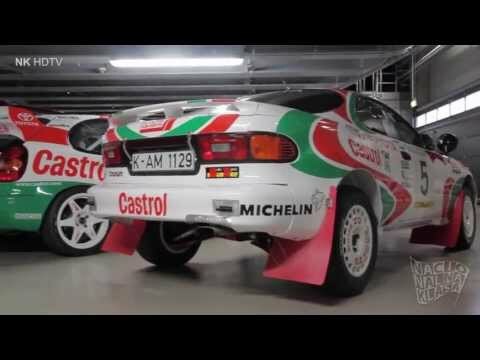 That year also saw the demise of the WRC team, finishing on a high note with a manufacturers championship title, and the announcement that Toyota would join the ranks of motorsport’s elite in the Formula 1 series. After two years of development, the company entered F1 in 2002 and were one of only two teams to build the entire car – including the engine – under one roof. The team’s first drive in anger was at the 2002 Australian Grand Prix; it was an auspicious start, with Mika Salo scoring a point in the very first race. All the while, the company’s TTE tuning division (named after Toyota Team Europe, the initial name for the TMG group) was serving up hot versions of Toyota’s road going line up. As you may expect, the company has accrued a wealth of experience in the art and science of quickly making things that go fast — and when thousandths of a second separate glory from failure, bringing that experience to bear day after day is imperative. Alongside experience sits the 30,000 sq. m of kit – and now it’s all up for grabs as the doors to the Cologne facility are thrown open. OK, ‘thrown open’ might be a bit of an exaggeration. When I arrived at the hut guarding the entrance all cameras (including iPhone, iPad and MacBook) were diligently stickered over by the security guards before I had crossed the expanse of tarmac to the entrance proper. But, thanks to a partnership with UK-based 3D-Parts Ltd, if you’re willing to refrain from taking photos everything that lies inside is open to you, regardless of what you are looking to get made. So what exactly is on offer at TMG? In effect, everything you need to make a rally car, an endurance racer or an F1 car, all under one roof. The complexity of modern race cars necessitates a lot of processes, materials and experienced engineers to come together in harmony, and those resources – forged in the white heat of racing – can be applied to just about any prototype or final product you can imagine. For a start, the SLA room houses 10 customised, upgraded sterolithography machines. That’s impressive in itself, but what is even more striking are the peripherals and workflows developed to cater for the demanding internal clients. While the F1 team was active, all 10 SLA machines were operating 24/7 producing thousands of parts a week. The turnaround times were often exceptionally short and quality requirements extremely high. To keep up with the demand TMG instituted a regular maintenance plan for their AM equipment, executed by AT 3D-SQUARED, that helped ensure that race-losing downtime was never an issue. One of the current 10 machines is serviced each week on a rolling cycle, meaning that any given system is only ever 10 weeks away from its next service. This is above and beyond the original manufacturers requirements and is indicative of how the manufacturing arm of TMG approaches its work. The maintenance schedule remains unchanged now, meaning that the capacity TMG has is always available for internal and external clients. Once the resin vats are installed, the relentless quest for speed continues with a laser upgrade to a more powerful laser system, allowing a shorter dwell time and subsequently quicker builds. All SLA systems are also equipped with an internal camera to monitor the build process. Should something go wrong with a build, the relevant engineer will be alerted and can see the system live from a remote location. Said engineer can then decide whether to get out of bed at 3am, or not. In the next room two EOS selective laser sintering (SLS) machines are available, running Alumide, CarbonMide, and PA 3200 at 0.15 mm layer thicknesses. The maximum build size available is 700 ´ 380 ´ 580 mm in alumide only, or 340 ´ 340 ´ 620 mm in any of the materials. Again, the years of experience as a supplier to some of the most demanding internal clients has left TMG with lean, optimised processes that would be hard to replicate elsewhere as an in-house service, but is unsurpassed as an open service. Away from the additive machines, TMG has continued to invest in high-quality manufacturing solutions that are as applicable to medical, aerospace, automotive, consumer / industrial products and architecture as they are to motor sport. The CNC and Fabrication departments boast 15 five-axis CNC machines in a vast array of sizes from 1 sq. m work areas with an accuracy of 4 µm, to room-size machines with an accuracy throughout the volume of 20 µm and a repeatability of 10 µm. Quality the top of the priorities list for the department, a second nature reaction to years of unrelenting perfectionist clients. In-house CMM machines measure machined parts down to 1 µm accuracy to compare to the original data. Carbon is synonymous with racing, in its polymer composite form better known as carbon fibre (CF). It is no surprise then that composites are one of the core competencies for TMG with the ability to produce small parts right up to, predictably, car-sized parts. CF, glass fibre, hybrid fibres and Kevlar are all available, with a selection of processing options ranging from wet carbon fibre lay up (where the resin is manually applied to the CF and often cured at room temperature) through to advanced pre-preg technicques for ultimate strength-to-weight ratios. Experience creating safety critical composite parts as well as complex prototype and production geometries allows TMG to offer composites services to any sector with complete confidence. The icing on the cake is the finishing options available, including pattern, tooling and machining for final parts. As any top-flight manufacturer will tell you, the protection of intellectual property surrounding parts is on par with the need for unparalleled quality in the real world. TMG are uniquely positioned as independent suppliers to multiple hyper-competitive Formula 1 teams, often simultaneously. The fact that these fierce rivals are comfortable trusting a former rival with sensitive information, the sort of information that could be the difference between a winning season and languishing in the middle of the pack, is testament to the seriousness with which the entire company takes confidentiality — I refer you back to my experiences at the security hut!